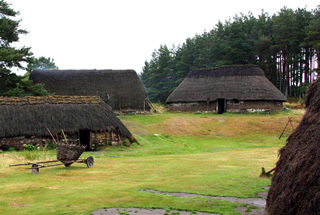 Vernacular buildings are traditional buildings that use local materials and methods. They range in scale from huts to tower houses, and in usage from cottages to tenements and farmsteads to smithies. They are found throughout Scotland – in town and country – and they are a vital part of our history. In contrast to polite architecture, the aesthetic of a vernacular building derives from its being rooted in folk, place, materials, and function. 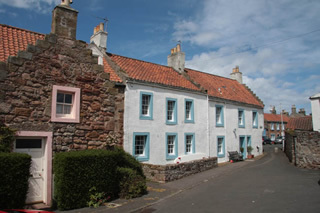 The Scottish Vernacular Buildings Working Group was founded in 1972 to provide a focus for people interested in these buildings. Our membership is as diverse as the buildings themselves: it includes archaeologists, architects, ethnologists, geographers, historians and surveyors, but especially those who are just fascinated by the buildings and want to know more about them. Membership and meetings are open to all with an interest, and we welcome contributions and suggestions. Attendance at our conferences, or participating in site visits, are ideal ways to learn from people with shared interests, and the perfect places to ask questions and hear discussion and opinion. The building itself is just one part of the story, however. Who built it and why? What documentation is available? Was it a common or unusual type? How has it been altered over the years? Key activities of the group are the survey of these buildings and their sites, and publication of research about them: their materials, settings, furnishings and functions, and the people who built and used them. Vernacular Building is published annually and includes a wide range of short papers covering all aspects of traditional building in Scotland. From time to time the SVBWG has also published volumes dedicated to a particular geographical area, type of building, or theme – the Regional and Thematic Studies series. They are useful to local historians and other people studying the past, and to those involved with the protection of important sites. The more information about vernacular buildings that is held in local and national records, the better the potential for their effective conservation and management. We have an Annual General Meeting each autumn, with sessions for offered or invited papers, and often an occasional spring or summer meeting or conference, perhaps in collaboration with another interested group. We are keen to establish links with other vernacular buildings groups and their members, and you may contact the SVBWG at: info@svbwg.org.uk. Membership details, and a list of all publications, are available on this website.